Got a lot of plates to display? 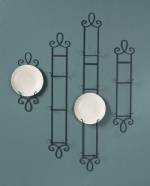 Then buy this money saving set of four of our Classic Three Place Plate Hangers! Part of our Classic Collection, this vertical plate rack features a durable black finish and is ideal for plates from 6 1/2" to 8" in diameter. Each rack measures 7 1/4" wide x 1 3/4" deep x 27" high. Lip depth is 1 3/4". An economical way to make your smaller collector plates look great! !